⬅ Tell Me It’s Not Melanoma! The excited chatter turns to an angry buzz and I hop out of my chair to see what caused the commotion. 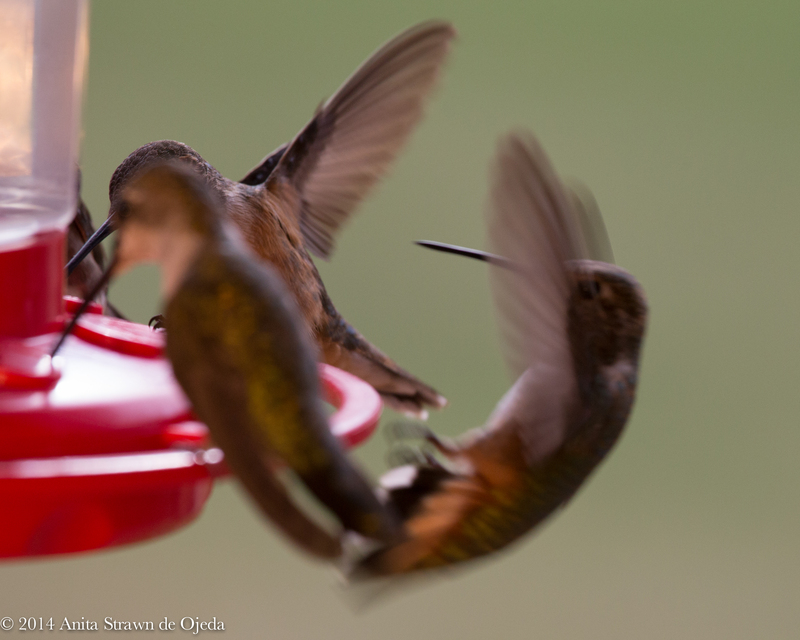 Tails spread and wings beating furiously, a female Rufous Hummingbird approaches and stabs her beak into the neck of the Black-chinned Hummingbird who peacefully feeds at the feeder hanging outside my window. 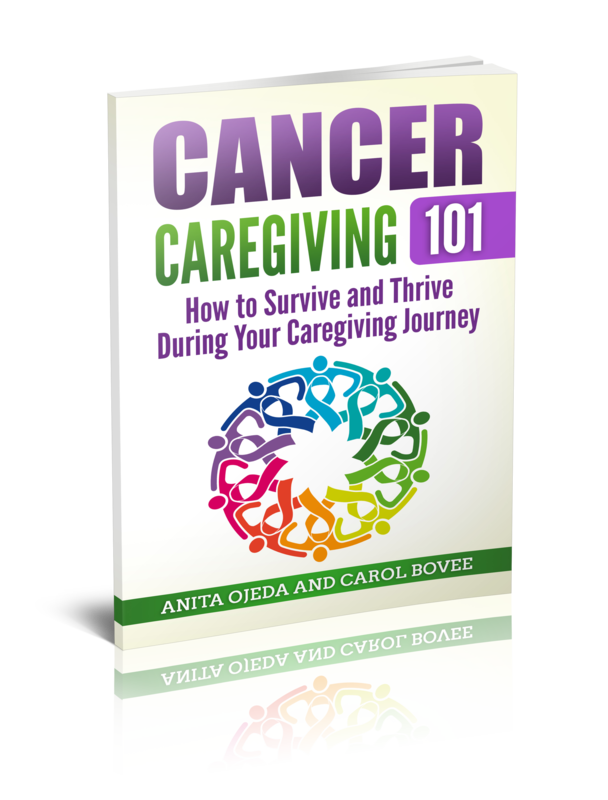 It seems as if they have an unwritten rules of engagement that only they understand. 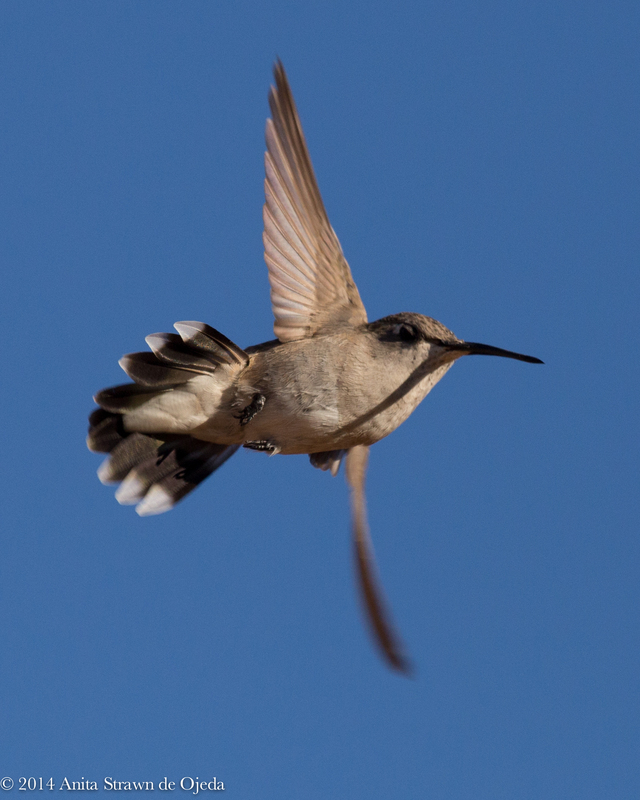 The Black-chinned Hummingbirds avoid conflict, for the most part. 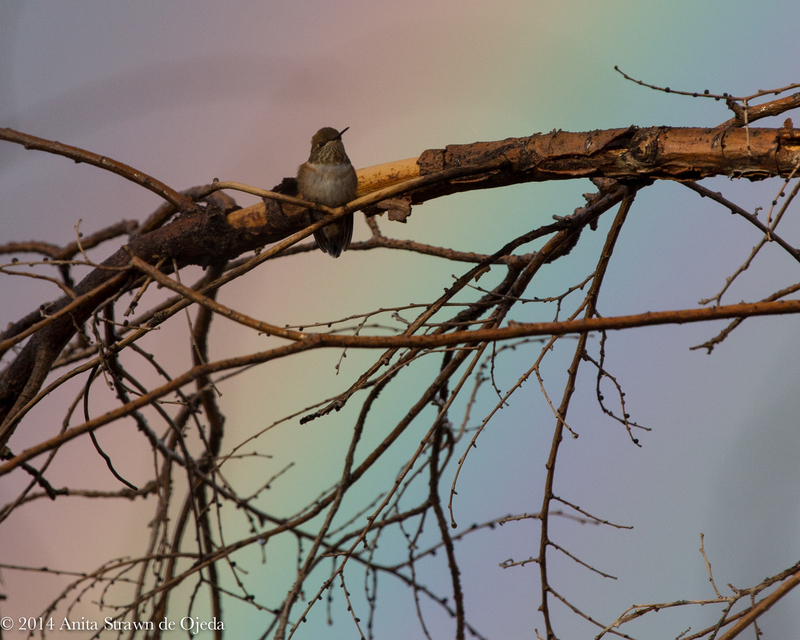 The Calliope Hummingbirds sneak in between the dash and clash of the Rufous Hummingbirds, while the mere high-pitched bell-like sound of a male Broad-tailed hummingbird will clear the feeders from fifty feet away. 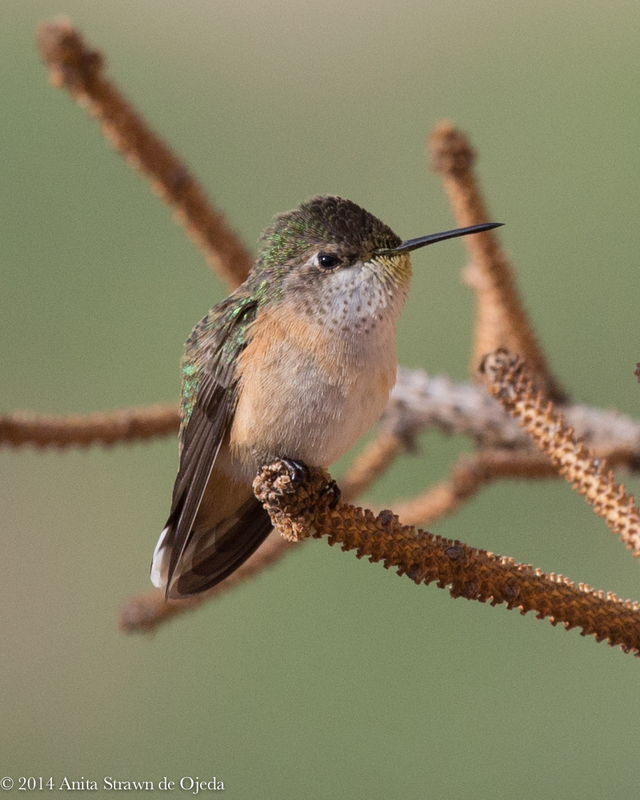 If fewer than eight hummers vie for space, a grumpy, territorial Rufous can easily keep them at bay—but not necessarily because she wants nectar—simply because she can. She’ll spend hours perched nearby, ready to swoop in and stab and poke and harass those who dare approach ‘her’ feeder. Meanwhile, the glimmer usually zooms around the house and drinks their fill at the feeder hanging on the back deck—until Ms. Grumpy wonders why she has no one to argue with, and goes in search of the rest. The process then reverses itself. Occasionally, someone bigger or smaller (but more intimidating) will put Ms. Grumpy in her place, and the hummers come in to the feeders and drink their fill in peace—usually politely taking turns. A strange thing happens when the community grows. 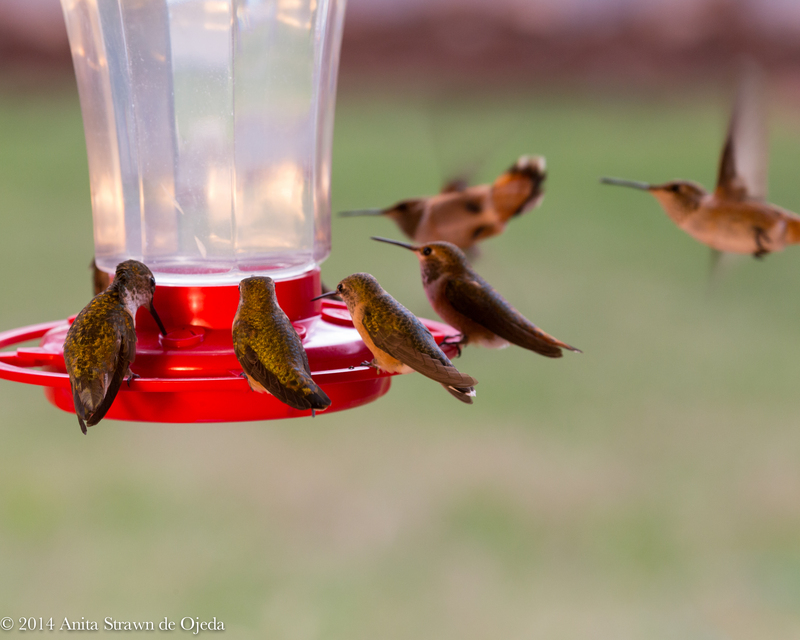 I’ve noticed that the more hummers that join the feeding frenzy, the less likely any one hummer will succeed at defending ‘her’ territory (don’t they understand that it’s all really MY territory—and that I want them all to get along and partake until they’re full?). 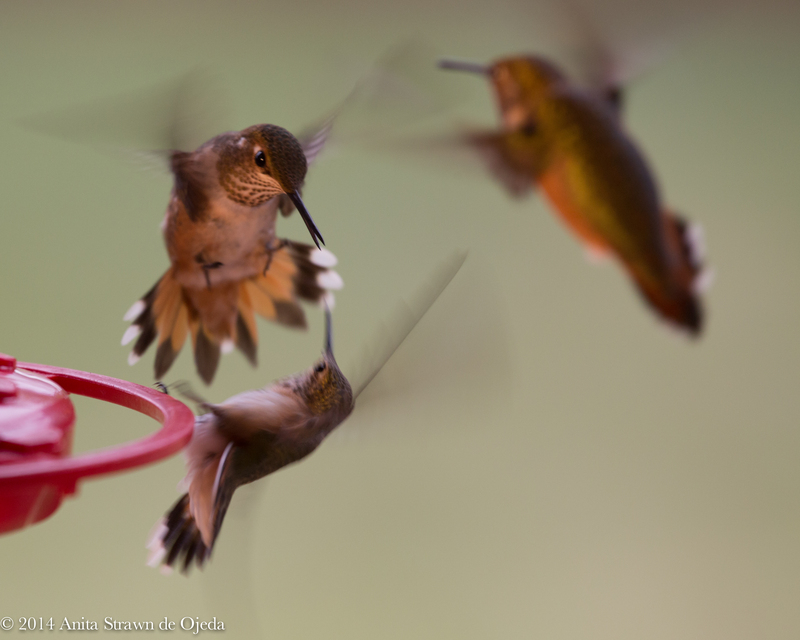 A strange unity of purpose forms in the larger community around the feeder as they lap up nectar as quickly as they can in order to double their weight for their arduous migration. Sometimes, 22 (I counted this morning, so I know it’s true) hummers sit peacefully around the base of the feeder—four different species feasting in harmony until a feisty hummer (usually a Rufous Hummingbird), swoops up from under the group and they scatter—only to shuffle positions midair like tiny pod racers and gather back around the ports on the feeder five minutes later. For five days, the hummer community (at least thirty-five came to my three feeders at once during those five days) allowed a hummer with half a beak (I named him Half-beak George) to jealously guard the smallest feeder in my yard. 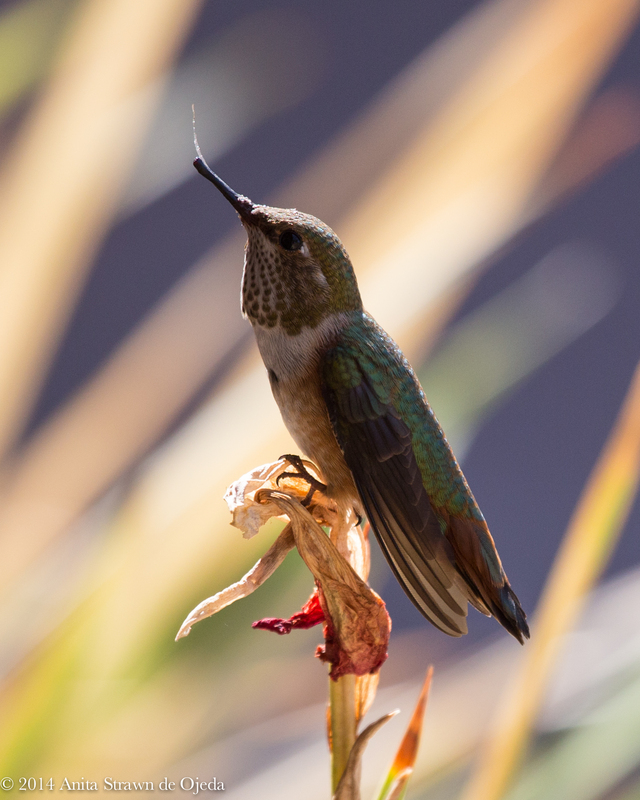 I can only imagine how a hummer would lose half its beak—and how difficult survival must be when one’s tongue permanently protrudes (talk about a case of dry mouth!). Half-beak George would perch on a faded flower blossom and keep a wary eye out for any intruders into ‘his’ domain. The other hummers would make half-hearted attempts to find nectar at one of the four ports on the feeder, but the little injured one would zoom after any who attempted. And while I felt sure that the entire glimmer could have staged a revolt (especially when the other feeders ran out of nectar) and mobbed the small feeder, they never did. They even let Half-beaked George join them at the big feeder when the small one ran out. What if Christians Acted Out of Character, Too? 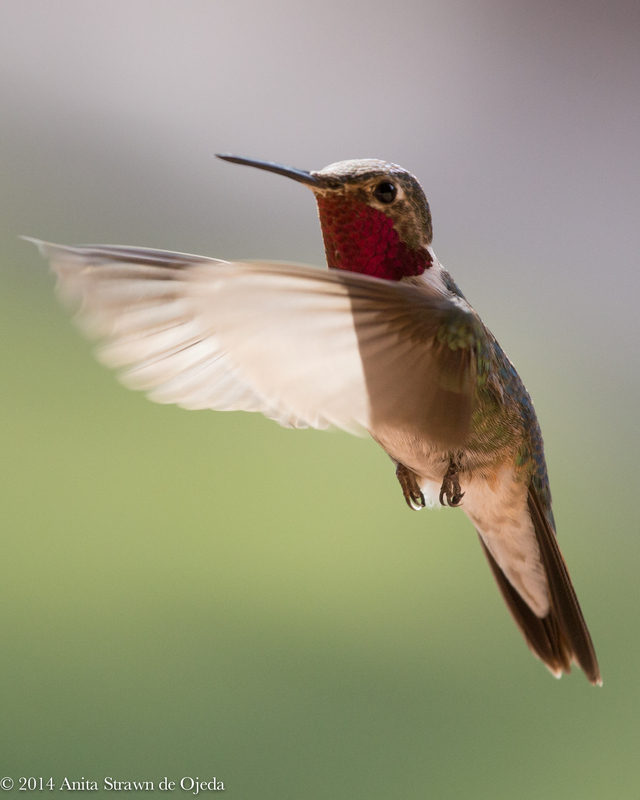 Followers of Christ so often act like a community of hummers. We, too, come from different backgrounds and races with our corresponding manners of making ourselves heard and protocols for behavior (and many times we feel like we’ve read the wrong playbook). We also have an arduous journey laid out before us (thank goodness we don’t have to double our weight) that requires us to grow and put on spiritual muscle through a constant diet of the words that are sweeter than honey. Our journey takes a lifetime, though, not just a season of migration. We often squabble and argue and disagree in the most vociferous way—which probably prevents others from joining our community. Some of us try to join the banquet, and find ourselves knocked around because we don’t understand the rules. Some of us poke and prod each other more than we need to, and we have a hard time settling down to just fellowship together in peace. But at the heart of community—even among a loosely knit group of migrants who show up in late summer—is an inherent kindness when we see the outward injuries of a fellow human (or hummer). What would happen if we assumed that our fellow humans carried unseen injuries just as severe as the ones we can see? Would we tolerate each other’s foibles without judging them? Would we work a little harder to make sure that others got their due and not worry so much about whether we received what we judged we deserved? So the next time someone cuts you off in traffic, or reacts rudely to a simple request, think about Half-beak George. When you feel shut out of #community, remember that others hurt like you do. And most of all, remember that community is never OUR domain. The Church belongs to God. The community’s purpose is to serve Him. God promises that there’s room at the feeder table for everyone. If you’d like to read more about community, buzz on over to Kaitlyn’s link-up.